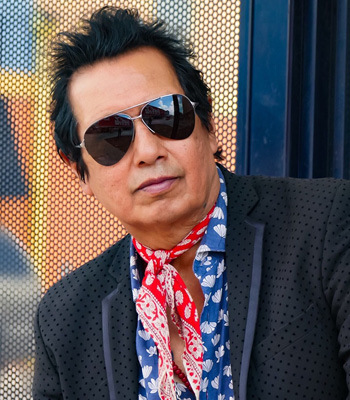 Crossing borders, jumping barriers, taking risks, betting it all: that’s the path Alejandro Escovedo has been taking in his lifelong search for the heart of rock and roll. This time around, an incredible group of special guests join him on the journey: Wayne Kramer (MC5), James Williamson (The Stooges), Joe Ely, John Perry (The Only Ones), and Johnny Moeller. With these musicians' powers combined, this is a can't-miss show to kick off the new year. Alejandro’s new album, The Crossing (YepRoc Records, September 14) is about that journey: searching, but not necessarily finding, eyes and ears open all the way. It is his first for Yep Roc Records and his first ever recorded in Europe. “This says more about me than any of my records without it being a record about me,” Alejandro says. The Crossing tells the tale of two boys, one from Mexico, one from Italy, who meet in Texas to chase their American rock and roll dreams. They discover a not-so-welcoming, very different place from the Promised Land they imagined, with cameos from the likes of Wayne Kramer of the MC5, Joe Ely and James Williamson of the Stooges to show the boys the way. Escovedo’s trailblazing career began with The Nuns, San Francisco's famed punk innovators, to the Austin-based-based alt-country rock pioneers, Rank & File, to Texas bred darlings, True Believers, through countless all-star collaborations and tribute album appearances and finally a series of beloved solo albums beginning with 1992's acclaimed Gravity, Escovedo has earned a surplus of distinctions: No Depression magazine's ‘Artist of the Decade’ Award in 1998 and the Americana Music Association's Lifetime Achievement Award for Performing in 2006, just to name two. His last album Burn Something Beautiful was co-produced, written and recorded with Peter Buck and Scott McCaughey. Alejandro worked with producing legend Tony Visconti (David Bowie/T-Rex) on Real Animal and Street Songs of Love; he has previously worked with Chuck Prophet, John Cale, Los Lobos, Willie Nelson and Bruce Springsteen. Now Hepatitis C free, Alejandro serves as a spokesperson for the Prevent Cancer Foundation “Think About the Link” campaign about the link between viruses and Hep C. As an official showcasing artist, the Alejandro Escovedo Band with Don Antonio will debut The Crossing at the Americana Music Association Festival 2018 at the Americana Music Stage, hosted by WMOT Roots Radio, NPR Music and World Cafe.